Former President Olusegun Obasanjo has revealed that political leaders and other key players in both public and private sectors in Africa launder the sum of $50 billion every year. The former President spoke at the 1st Annual Nigeria Anti Fraud Conference organised in Abeokuta by the Association of Certified Fraud Examiners, ACFE, Lagos, Nigeria Chapter. The ex-Presiddent said that the increasing smuggling of such funds meant for socio-economic growth and development of African continent is now giving African leaders, past and present, great concerns. 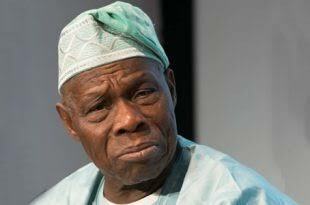 Obasanjo who called for joint effort to curb smuggling of funds to foreign lands. Obasanjo who was named as Grand Patron of ACFE, Lagos Nigeria Chapter asked the financial professionals and all members of the Association to help fight fraud and corruption in Nigeria and Africa as a whole. He said, “$50 billion annually, is illicitly taken away from Africa, this is a major concern for African leaders, past and present. “We are now trying and putting up efforts to ensure that we prevent it. President and CEO of ACFE, Godwin Oyedokun, speaking earlier, said, “It is really a delight to h Olusegun Obasanjo. Your acceptance of our invitation is an indication that you have the love of this nation at heart. Let me say that two things informed our decision to have you in our midst. “First, ACFE, Lagos Nigeria Chapter recognises your role in sanitising the Nigeria system before, during and even after you have left government. Secondly, we want to honour you as our Grand Patron, the one we could always run to, for advice, guidance and mentorship.